We’re excited to announce we’re holding a ‘Demo Day’ on Sunday 20 May! We’ll have a variety of bikes for you to check out and test. 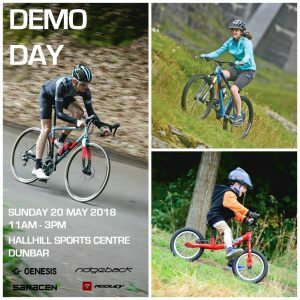 A range of brands will be available such as Genesis, Ridgeback, Ridley, Saracen, Forme, Polygon, Tifosi, Cuda Performance, Dawes and Squish kids’ bikes. Road, mountain bikes, leisure or commuting there will be bikes to whet your appetite. Cyclocross and gravel bikes will feature too, as well as bikes for all the family. Even Toddlebikes designed for the littlest of the new generation of cyclists. Not forgetting the opportunity to demo an electric bike! Whether you’re a seasoned cyclist or just starting out, drop by for a chat and a great day out! We’re also running a ‘Prize Draw’ on the day for a chance to win a Belhaven Bikes £50 gift card. Ideal to use towards a new bike! *Test riding bikes is free of charge but, as is usual on Demo Days, please bring along photo ID and a credit/debit card.